Prominent & Leading Manufacturer from Navi Mumbai, we offer fingerless type single facer and fsf series finger type single facer. We are leading supplier of Fingerless Type Single Facer. Flute profiles: A, C, B, E available. Flooding system lubrication of the reduction gearbox, three axis gimbal transmission, isolated power supply, frequency converter control of the main unit. Pneumatic control of the upper roll, press roll and gluing roll. 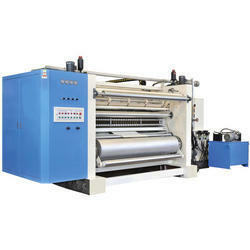 The bearings of corrugated rolls and press rolls are lubricated by high-temperature lubricating grease. Motorized digital readout device, auto adjustment of the glue application. The corrugated roll is made of special alloy steel with grinding process and hardened with the hardness of HRC56-60. Anilox glue roll is chrome plated. We are leading supplier of FSF Series Finger Type Single Facer. Corrugated flute roller is made of high-quality alloy steel material duly heat treated, hardened and chrome plated. The surface hardness is maintained between 56-60 HRC. Corrugated roller and pressure roller bearings are lubricated with high-temperature grease. 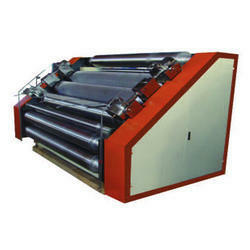 Anilox glue rollers are used for uniform glue application. The gluing width control is manual. Motorized control can also be provided as an option. Looking for Finger Type Single Facer ?